"He's been insisting for the last three or four years that he's at least partially retired and intends to retire completely, until the phone rings." Today's typical film audience appears to have nearly forgotten about Buster Keaton. Yes, movie buffs continue to marvel at his mechanical gags and his deadpan stone face for any circumstance. Plus, he does live on in the popular work of action stars like Jackie Chan, who use a similar type of precise choreography with real stunts to entertain audiences. During the production of Keaton's 87th picture - The Railrodder - Canadian director John Spotton filmed him still working as an old man. This 1965 documentary - entitled Buster Keaton Rides Again - presents an intimate portrait of an amazing and multi-talented film legend. The 70-year-old Buster Keaton may have more wrinkles, but he still possesses the energy of the young man who wowed audiences in The General and Sherlock, Jr. His eyes still have the same flair, and the hat is still one of the flattest around. As early as age 11, Keaton was creating gags of his own for vaudeville shows. Within his films, mechanical items usually overwhelm individuals, and this leads to inventive and side-splitting humor. The events are often crazy, but elements of reality must exist within the story. 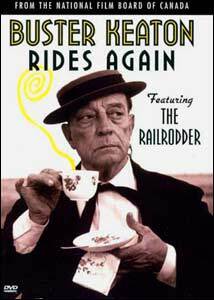 Buster Keaton Rides Again depicts the multiple talents and interests of this fascinating man. Behind the scenes, Keaton strums away on a guitar, marvels at the game of baseball, and plays cards with the film crew. On the set, gags are created and improvised on a daily basis, with Keaton standing right in the middle of the action. His formal education lasted only a single day, but he exudes the intelligence and wisdom of a scholar. The precision required to stage action such as the train sequences in The General is mind-boggling. A virtual travelogue of the Canadian countryside, The Railrodder focuses on the nonchalance of the title character as he rides across the country. His little vehicle barely misses numerous obstacles, including a full-length modern train, but he doesn't blink an eye towards the danger. In fact, his largest concern resides in the need to get comfortable. He spends his time having tea, trying to sleep, and reading the map. Unfortunately, things usually show up to complicate his enjoyment. A running gag concerns the amazing number of items that exist within the small box on his train. When it's cold, a fur coat is available, and when it's dirty, a broom is inside. Throughout this brief 25-minute film, Buster Keaton successfully utilizes the famous stone face in every environment. The large mountains and skyscrapers hardly emit a change in expression from his character. He speaks no dialogue, and it harkens back to his heyday in the silent film era. Through his mannerisms and interaction with various props, it's easy to understand his actions. Keaton's moves are backed by an excellent score that often complements the events occurring on the screen. The end result is pure silliness, and it combines well with the documentary to raise appreciation for this comic genius. Image Transfer Review: This full-frame transfer of The Railrodder is noteworthy for several instances of fantastic colors within the Canadian scenery. The blue skies and impressive mountains stand out and create a magnificent view of the wilderness. Unfortunately, both this film and the documentary contain a significant amount of visual defects. Specks of dirt and lighting problems arise several times in each feature, which are surprising considering the impressive and clear colors that exist in certain scenes. Overall, the visuals work decently for the most part, but needed a little more effort to reach the next level. Audio Transfer Review: The simple mono audio tracks on both features work well enough to avoid detracting from the presentation, but they lack real energy, especially during The Railrodder. It contains nearly constant music that drives the action and corresponds with Keaton's movements on the train. A 2.0-channel Dolby Surround track would have been a nice addition to this quirky story. Since it contains zero dialogue, the music is essential to the enjoyment of the film. Extras Review: Since both the documentary and the film are treated as parts of the main feature, there are no extras on this disc. Buster Keaton Rides Again presents a compelling behind-the-scenes view of a talented actor who continued to work until the final years of his life. His character in The Railrodder may lack a youthful exuberance, but he still hits all the right notes to generate excellent comedy.